Following my spontaneous visionary awakening in 1996 (read more here), I immersed myself in the language of mandalas. During a week-long intensive, participants envisioned a mandala to symbolize their “work in the world that would embrace unity and celebrate diversity”. My vision, “Celebrating Diversity”, revealed my hand transformed into a tree (unity). Various kinds of fruit (diversity) grow from each finger. Two salmon swim toward each other at the base of the tree. In 1998, I emerged from a 12-year cocoon. My focus shifted from a very personal worldview as a psychotherapist in private practice to the larger vessel of community. I realized that the vision manifested through “Celebrating Diversity” was not only a metaphor but also a literal representation for my work in the world. 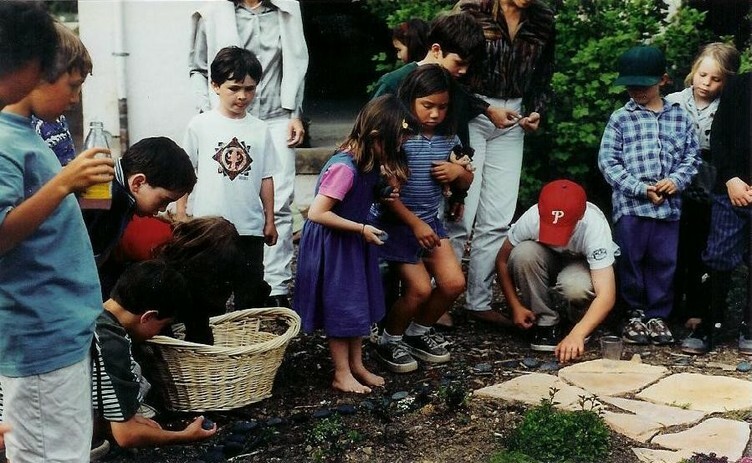 That year, I birthed a long-term vision to facilitate community-based environmental art called Healing Hearts-Healing Earth. 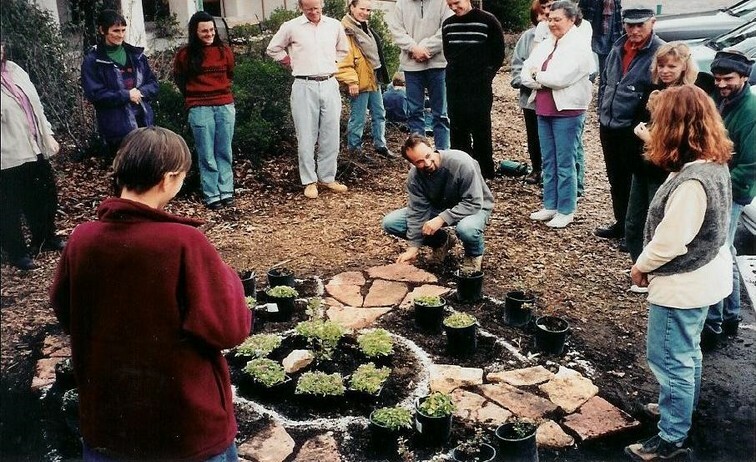 It combines planting fruit trees, herbs, native plants and/or flower mandala gardens with community member’s heart-inspired drawings and prayers for personal, community, and global healing. I had already committed myself to facilitating several site-specific installations before I recognized the multiple levels of meaning in the symbols. It was a humbling and joyful revelation! The mandalas continually return me to the great mystery of Creativity. 1. Creating mandala drawings of heart wishes/prayers for communities, animals, habitats, global peace, or the Earth as a whole. 4. A community ritual for healing or celebration, which includes poetry, songs, and other creative expression. In the fall of 1999 I heard Julia Butterfly Hill speak from her nest in Luna. Three times she used the phrase “celebrate diversity”, to describe how the Redwood Forest, as a living ecosystem, naturally thrives. The synchronicity of her message with the image of my mandala "Celebrating Diversity" was obvious. In collaboration with Julia Butterfly, I donate 100% of the profits from the sales of my "Celebrating Diversity" mandala cards to her efforts. I have contact information about The Plight of the Redwoods (an educational project co-created by Julia Butterfly and Redwood Mary) printed on the back of each card. In my psychotherapy practice, I have explored tools for navigating the terrain between personal boundaries and the transpersonal experience of no boundaries. 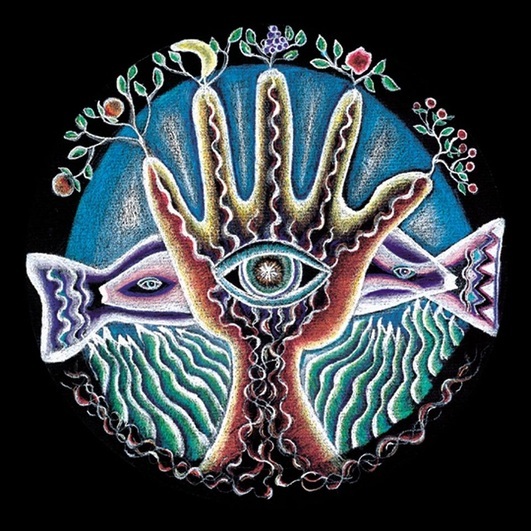 I experience mandalas as a doorway connecting the two. My prayers are for personal and global healing. Addressing animal rights and environmental issues, my mandalas are vehicles for public education and inspiring right action. I feel called toward helping others to create mandalas in the spirit of environmental education and inspiring pro-activity (hands-on work and political action). I have created mandalas with children and adults to honor the California Oak trees and educate the community about Sudden Oak Death. 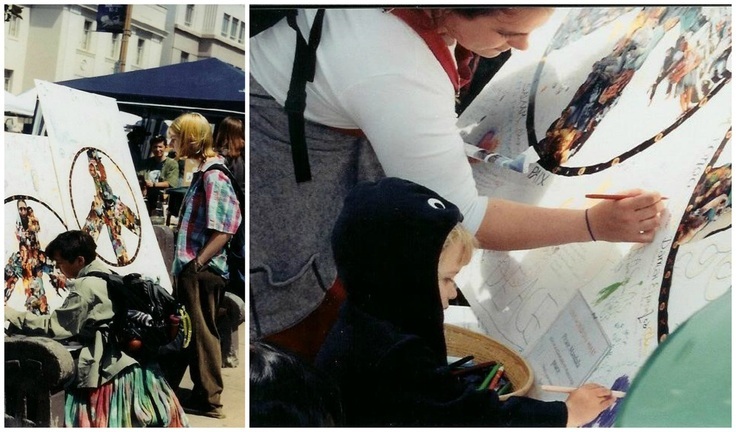 Through the mandala process I have also promoted awareness of the Navy’s sonar project, which is life threatening to marine mammals, and launched campaigns in response to 9/11 (see below), the Tsunamis of 2002 and 2011, and the destruction of the rainforest in Borneo in 2014. 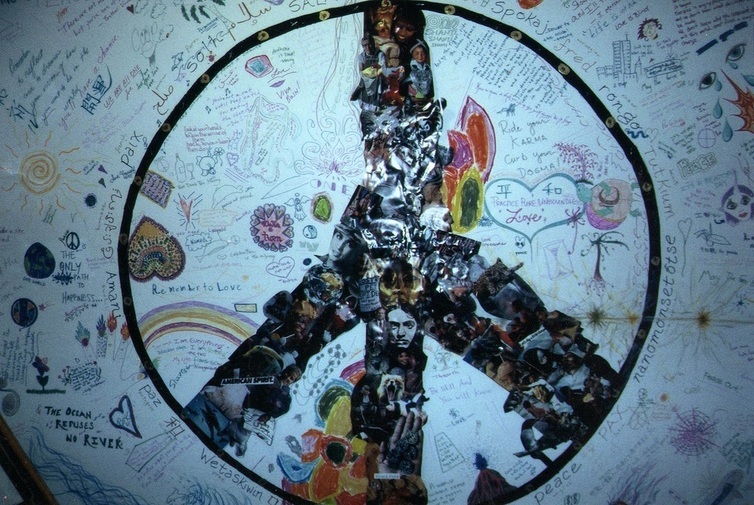 In September 2001, I began creating large-scale interactive Peace mandalas called “One World, One Heart, One Love Peace Mandala” as a vehicle for community to commune and heal from the events of 9/11. (5 x 6 @ CIIS 2001). Around the outside of the circle is the word "peace" as expressed in many languages. The original collage was comprised of National Geographic photos of our global community. An ongoing and evolving process, the Peace Mandalas have ranged in size from 3 x 5’ wall hangings to a 5 x 34’ expanding standing altar. They have been utilized in varying environments including: The California Institute of Integral Studies, The Berkeley Ecology Center, Dominican College, The Labyrinth Society conference, and Middle East Peace benefits. The Sea Turtle Restoration Project, Earth Island Institute’s International Marine Mammal Project, the San Francisco SPCA’s Kinship with all Life, Tara Mandala Buddhist Retreat Center and Treesisters. It is my deepest joy to invite others to experience their own luminous divinity through private counseling, retreats, classes, and publishing my visionary art mandala paintings. More information about my work can be found at www.mandalaweaver.com, or by calling Art & Soul at 415-455-5989. For Julia's Bio, click here.